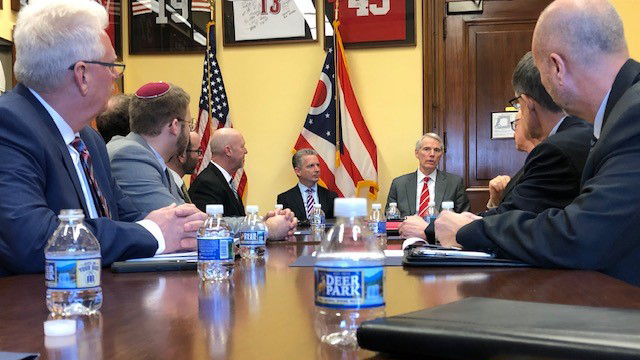 Volunteer and professional leaders from Ohio’s Jewish federations, including Cincinnati, took to Capitol Hill to advocate for increased security funding for faith based and cause based nonprofits at high risk of terror attack. 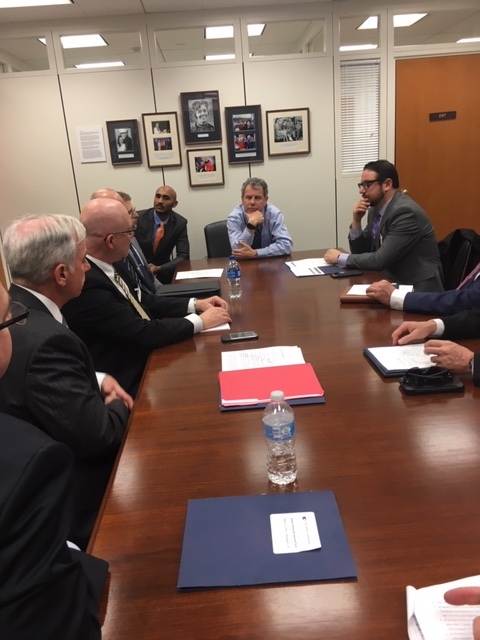 This March, volunteer and professional leaders from Ohio’s Jewish federations, including Cincinnati, took to Capitol Hill to advocate for increased security funding for faith based and cause based nonprofits at high risk of terror attack. “There’s no nice way to say this. A lot of violent people out there hate Jews and want to murder us,” said Howie Beigelman, Executive Director of Ohio Jewish Communities, the statewide government advocacy, public affairs, and community relations voice of Ohio’s eight Jewish federations. The delegation met with both of Ohio’s US Senators, Sherrod Brown (D-OH), and Rob Portman (R-OH). Appointments were also set with fourteen of the state’s sixteen Congressional offices. The group as a whole was one that could express the grave need from every angle. Four professional security directors, including SAFE Cincinnati’s Director Mark Dowd, two community CEOs, several agency or federation executives and JCRC directors could address the practical security gaps and the funding necessary as well as the impact on community life and on the ability to provide social services and philanthropic donations to those requiring help. “Since the Pittsburgh attack and the arrest in Toledo, our communities have been trying to do more to keep everyone safe,” said SAFE Cincinnati Director Mark Dowd. “We can’t do it alone. Indeed, based on very real, current safety priorities, the advocacy focused on the need to maintain and expand both FEMA nonprofit security grant programs, including the original Urban Area program but also the NSGP-S, created last year through the leadership of Senator Rob Portman (R-OH), which provided $10 million overall to states ineligible for the original grant program. Through that, Ohio nonprofits at risk of terror attack received nearly $600,000 in needed grants for target hardening against attack. As well, the advocates focused on the need for armed security personnel, either as school resource officers or special duty officers, for nonpublic preschool and K-12 schools. It wasn’t just the Ohio federations and the Jewish communities across Ohio who joined for this advocacy. Agudath Israel’s Ohio director, Rabbi Yitz Frank, was with the group for part of the day. On the national level, “JFNA, with its dedicated Washington Action Office led by William Daroff, and especially, their homeland security policy lead, Rob Goldberg, was instrumental in crafting our legislative advocacy,” added Beigelman. Prior to the Fly-In, Beigelman notes the Jewish community’s national community security umbrella, SCN, was consulted. National Director & CEO Michael Masters and Deputy Director & COO Patrick Daly offered insight and expertise regarding working with DHS and on current security best practices for local law enforcement and nonprofit agencies. Mark Dowd also sits on a SCN committee looking at ways to leverage local needs and national expertise. “The right thing for us to do is to examine and address our local security needs in a way that also supports and boosts the similar needs of other Jewish communities across the country. We were very encouraged to hear that our Ohio Congressional representatives felt the same and offered their continued support for these collective efforts,” he remarked. 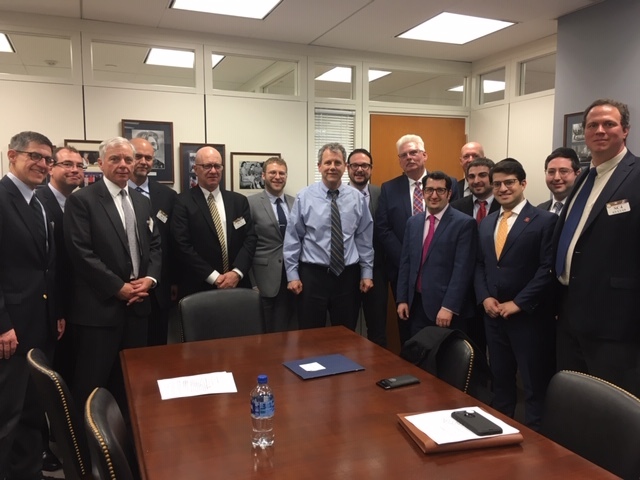 A delegation of volunteer and professional Jewish leaders from Ohio met with both of Ohio’s US Senators, Sherrod Brown (D-OH), and Rob Portman (R-OH). Appointments were also set with fourteen of the state’s sixteen Congressional offices. Beyond the immediate needs and legislative advocacy, the day was also an opportunity to update policymakers on innovative ideas and new directions in community safety, many of which require partnership with federal, state, and local law enforcement. And, everyone agreed that this week’s Fly-In wasn’t an end, but the beginning of an increased and sustained advocacy on community safety.